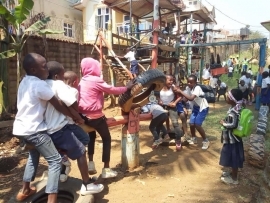 (MissionNewswire) The Don Bosco Center opened in 2014 in the city of Bukavu in the eastern region of the Democratic Republic of Congo (DRC). Operated by two Salesian priests and one Salesian brother, the center is located near the main town square and a prison and is an ideal location for missionaries to meet the many street children who spend time in the square washing cars, carrying luggage and parcels, stealing and begging. Shortly after the inception of the Don Bosco Center, a Salesian school was opened on the premises which serves the local population. Word has spread among the local population that Salesian missionaries are there to help. While they can’t meet every request, missionaries are focused on providing for the urgent needs of the community. He notes that people come with problems such as landlords kicking people out because they have not been able to pay rent. Others have had small businesses that have closed and lost capital because they got sick. There are families who need shelter and babies who need proper nutrition. Rebecca, the mother of eight children and a widow, asked for help for her youngest son, Joseph, who was born with hydrocephalus. The operation to treat him cost $500 and Rebecca had no way of paying for it. Seeking help at the Don Bosco Center, she found that the Salesian missionaries there were willing to fund half the amount. The other half was provided by a relative of Rebecca. The operation was successful. Rebecca continues to carry bags of coal and wood on her back to bring in money to feed her children and help pay for at least one of her daughters to go to school. Salesian missionaries at the Don Bosco Center lend support to families who cannot pay their children’s public school fees. Depending on the degree of vulnerability, the center has intervened to pay half or all the school fees for about 150 primary and secondary school children. The center also has a courtyard which allows children from the local community to come together and play year-round. Chantal, who is 24 years old, also sought help at the Don Bosco Center. She is one of seven daughters and lost her father by the age of 14. Thanks to the hard work of her mother and several benefactors, she was successful in her studies. But when her mother died last year, she risked having to leave school after having reached the sixth year of medical training. Salesian missionaries paid a portion of her school taxes and helped her to get an exemption from payment and a scholarship.